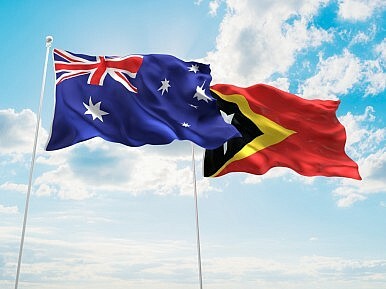 Timor-Leste’s ambassador to Australia on his country’s independence movement and its maritime dispute with Canberra. On the back of the recent disputes between Australia and Timor-Leste, one man has featured prominently in the Australian media: Abel Guterres, Timor-Leste’s ambassador to Australia. In TV interviews he is the archetypal diplomat: Oxford educated, articulate, and engaging. Yet Guterres arrived in Australia 25 years ago with no English, no money, and no country to call home. He became a bus driver, a part-time activist, and eventually an ambassador. The Diplomat’s Ben Weir recently spoke to Guterres about his life, Timor-Leste’s independence movement, and the future of Timor-Leste’s relationship with Australia. How did you come to leave Timor-Leste? I was in Baucau and we saw these Australian military Caribou airplanes land. This was the first time I had seen something like that; they were huge. I was interested, so I went to the airport with a group of friends. We were about 500 meters away, and there was a kerfuffle going on. One of the people had a grenade and he threatened to blow the aircraft up if it did not evacuate people. But the plane had flown in with instructions not to evacuate people, so there was an argument going on. Once the invasion [of Timor-Leste by Indonesia in 1975] took place, that was it. We hardly understood English but they were showing the pictures on television. A group of us were sitting together and we thought, “This is it, we are not going to go back,” and we all cried. How did you become involved in the Timor-Leste independence movement? Around 1978 I started to become involved with the resistance with the Australian East Timor Association and I became an activist. There was still no information filtering out but there was a sense that they would not have wiped out everybody, some would still be alive and we still had to have hope. So I went to meetings, tried to keep the issue alive and learn more. At that early stage my political awareness was very minimal. But I felt an obligation that I needed to learn and understand. Timor-Leste’s struggle was not prominent in the media at this time and you were up against a regional superpower. How did you stay motivated? You make a conscious decision to engage in the struggle, regardless of the cost, regardless of the timeframe. I personally made my own decision that I would engage with the struggle until I died. I would prepare my children so that if I dropped dead, they would carry on with the struggle, because they would understand it was so important. So you prepare yourself for that, because if you don’t do it who is going to do it? Not only that, but you see your Australian friends who are going to meetings, and are prepared to make every effort, knowing that it’s not their land; they have never been to Timor-Leste. It’s just their pure human solidarity that they have shown. So as an East Timorese person I should do better and I should do more. That gives you the motivation to keep going. In 1991, hundreds of civilians were killed by Indonesian soldiers in the Santa Cruz massacre. How did you feel at the time? You feel sadness because this was a premeditated massacre. The military lined people up and shot them; it was a huge loss of life. But this was also a huge boost for us to tell the world what the Indonesians were doing in Timor-Leste and at the time Indonesia was telling the international community everything was okay. It was not. People in the international community who had been bystanders or who had doubts — that completely changed after Santa Cruz. But it required something like that for people to come on board, and that’s a pity. In 1999 Timor-Leste held an Independence Referendum and you went back for the first time in 24 years. How did that feel? That was as a whole a mixed feeling, and it was quite an interesting feeling in the sense that people you expected to be alive were dead and people you expected to be dead were alive. I knew that my mother and one brother were still alive so it was good to see them, but the rest of my family had been killed. In regards to the referendum, people were lining up at 4 am to vote. Being among those people, who had suffered for 24 years, was hard to put into words. It was an experience that I will never forget. Peoples’ determination to cast their vote, even if they were shot while casting their vote, was inspiring. People felt partly excited but partly apprehensive for what would happen after that. Personally, I fulfilled my dream to cast my vote and if I was killed afterwards, so be it; I would die at home. You had that at the back of your mind as a comfort. So there was less fear. How did you go from driving trams in Melbourne to studying at Oxford University? In 2000 I went back to Timor-Leste and Jose Ramos Horta called me and said, “We are going to need people to set up the foreign ministry. So I want you to go to Oxford.” I thought he was joking. I mean, it is not just any university. I was shocked when he said he was serious. I had never done any undergraduate study, so I did not know if I could do it. I was a bus driver from Melbourne but they said yes you can come. The first three months at Oxford were tough, but after that it was okay; you get used to it. What was the biggest challenge Timor-Leste faced when you joined the foreign ministry? We had to get more international support because 80 percent of the country was destroyed. People were completely traumatized and as a government we had no money. So in the first few years it was about gaining support from the international community from wherever we could get it. Australia played an important part in that as our closest neighbor. And as a young democracy we think it was very important to have a helping hand from a very successful democracy such as Australia. You spoke about how strong the relationship between Australia and Timor-Leste is. How is the maritime border dispute impinging on that relationship? It is quite a critical piece of that relationship, is it not? Yes, it is a critical piece for Timor-Leste in completing its independence and its sovereignty, as each country wishes to do. That Australia is refusing to settle does not mean Australia is our enemy. Australia is our friend and that is why this relationship is strong, as we see each other as a friend. Now within this friendship we have disagreements on issues. The maritime border is very important for Timor-Leste but also for Australian interests, because [resolving] it gives certainty to investment in the region. This is good for business. Domestically, how big of an issue is this? Earlier this month there were protests outside the Australian embassy in Dili. There is a huge awareness in the country about the maritime border issue. For Timor-Leste this is another struggle for our full independence and sovereignty over land and sea. So everybody is aware, you need to understand that the current generation of East Timorese are the people that fought the war with Indonesia. We feel sad that it took us 24 years and the loss of a quarter of a million people [to end] this struggle with our northern neighbor. Now we have to carry out another struggle with our southern neighbor because it simply refuses to sit and negotiate the boundary with us. So we have to fight and struggle again, but this time it is intellectual rather than blood and tears. The danger is if you allow this issue to fester it will undermine the confidence in the relationship and that is not good for both the countries. As ambassador my job is to maintain this equilibrium and while we deal with our differences other parts of our relationship must stay the same. What is Timor-Leste’s official position? That Australia should adhere to the international maritime boundary. But the fact that Australia withdrew from the jurisdiction of the UN’s Convention on the Law of the Sea (UNCLOS) means it leaves Timor-Leste with no other recourse except compulsory conciliation — that is the only avenue open for us. Australia boasts about how it always feels negotiation is better than litigation, but they refuse to negotiate. So what other choice is there? The revenue from the oil and gas would underpin the whole of Timor-Leste’s economic success. We want to be as prosperous as any other country and we have the resources to do that. We will keep lobbying until we are proven wrong in court. Timor-Leste is only claiming what belongs to it under international law, no more, no less.